Last night Doddington Dairy was announced winner of the BBC Food and Farming Awards for Best Food Producer at a prestigious ceremony held at College Green in Bristol. The award was presented to Neill and Jackie Maxwell by one of the judges, chef proprietor of Café Spice Namaste and celebrity television chef, Cyrus Todiwala, OBE DL. This is the first time a company in Northumberland has received this award so it is a tremendous accolade for both this ice cream and cheese producer, and the county. Twenty one years ago, Neill and Margaret Ann Maxwell who farm at Doddington near Wooler in Northumberland launched Doddington Cheese, to add value to their milk. Later in 2000, Neill and his wife Jackie launched Doddington Dairy Ice Cream, and last night they were awarded the “Best Food Producer” award at the BBC Food and Farming Awards ceremony in Bristol. When they launched their cheeses, they were one of the very few companies in the UK producing hand crafted, unpasteurised cheese’s. When they launched their ice creams they were the only farm based ice cream producer between Aberdeenshire and York, today, they are one of the very few dairy farms left in Northumberland. “We are absolutely delighted to receive this incredible recognition on a national platform and from such esteemed judges who recognized the quality of the products we produce. 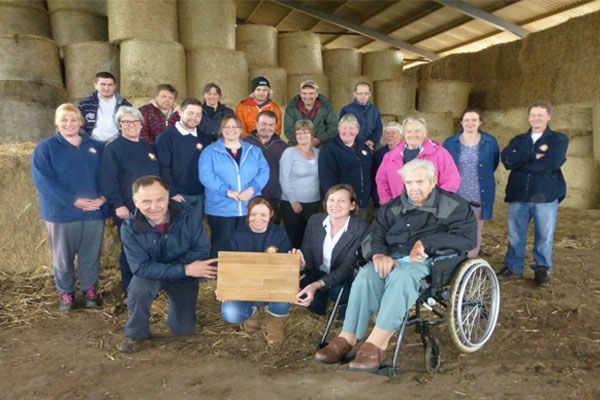 Currently employing in the region of 20 people in the dairy and on the farm, over the years the Maxwell’s have worked very hard to extend and develop their range of products. The entire family is passionate about local provenance and use only natural ingredients, both the cheeses and ice creams are still today made from their own milk, and where possible they support and work with local producers and brands synonymous with the region. Examples of which include, Chainbridge honey, Alnwick Rum, Newcastle Brown Ale, and their very own, apples and rhubarb. Doddington Dairy products are sought-after the length and breadth of the country and over the years they have received some of the highest industry accolades. They are a progressive company; they do not stand still and are always looking for new and innovative ideas to further their ranges of both ice cream and cheese. Last year to commemorate one of the North East’s most recognised heroines, Grace Darling; they launched their first Blue Cheese, Darling Blue. To celebrate both the Sage’s 10th, they produced for them a special Strawberry and Champagne Ice cream. Further information and details of all Doddington Dairy cheeses and ice creams can be found at www.doddingtondairy.co.uk or by telephoning 01668 283010.